An Autumn scene captured in Algonquin Provincial Park, Ontario and then converted using the Oil Painting filter in CS6. Malcolm, very interesting composition with the curved road on the left, nicely balanced by the broken tree on the right. The autumn color is splendid, and the painting, when viewed large, is first-rate – you maintained excellent detail, but still revealed visible brush strokes. It's interesting how the vegetation took on a variety of textures and looks. The Foxtail and live trees look cool, but the tall dead trees in the right BG are sort of spooky looking. Very nice color palette. Thank you Ron, I've visited this spot the past four Autumns and finally got the leaf colour, weather and lighting conditions that I wanted. I appreciate you having a look and the detailed comments. Thanks Joe. 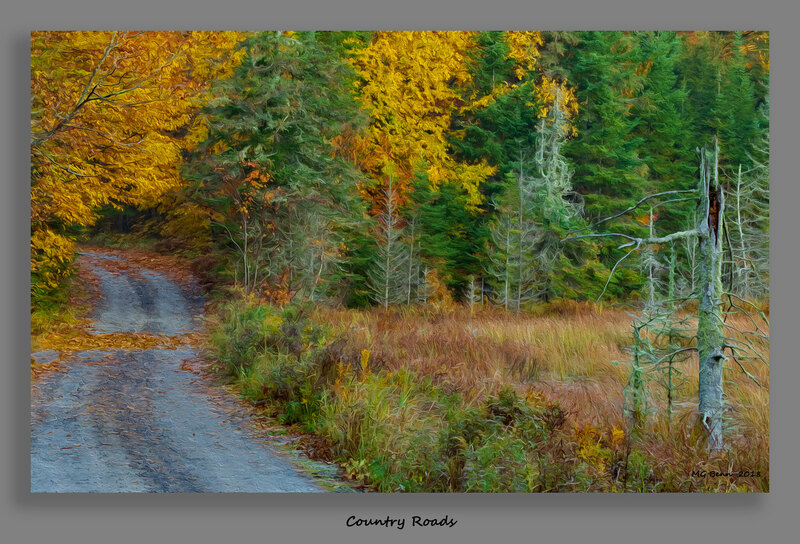 I've always loved the range of textures and colours along this road. The dead tree on the right always reminded me of a ghoul pointing at the road. An early Halloween photo. Worth a click- quite beautiful- textures and colors just right. lovely composition with the curving road. You must have had some nice fall color up your way. We mostly got brown and a bit of yellow. Gee I didn't notice the "ghoul" till it was pointed out! I hope that ghostly dead tree isn't beckoning all comers to follow the road into the woods.........never to be seen again....!!! Beautiful scene with the autumn colours and the lovely textures, Malcolm. Very nicely done! I love this shot. Personal preference would be a little more mid-tone contrast. Thank you Cythnia, yes the colours were pretty good this year, not enough reds for my taste but it was certainly better than the past few years so no complaints other than it's never long enough to get to all the places I'd like too. I love that ghoul tree. Yes that's how I see that scene ... the ghoul tree is pointing at the road and either warning travelers or beckoning the naive. Thanks for having a look Carol.